A challenger in the America's Cup race is not afraid of the competition -- it's the nation of Iran it's worried about. 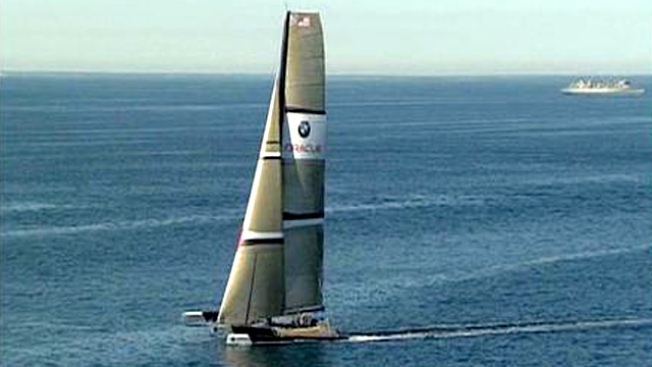 BMW Oracle Racing said Ras al-Khaimah, in the United Arab Emirates, is unsuitable in part because the proposed racing area is within 17 miles of islands occupied by Iran in a territorial dispute with the United Arab Emirates. Citing "grave safety concerns" for its U.S.-based crew, challenger BMW Oracle Racing is asking a New York court to reject Ras al-Khaimah as the venue for the 33rd America's Cup and replace it with Valencia, Spain. BMW Oracle Racing said in a statement late Thursday night that defending champion Alinghi of Switzerland cannot select a Northern Hemisphere port without mutual consent of BMW Oracle Racing. "I don't exactly know what to say," Larry Ellison, the Oracle Corp. founder and CEO who owns BMW Oracle Racing, said in August. "I think they picked it because it's very light winds. I'm a little bit concerned because it's less than 100 miles from Iran, so we're all concerned about the safety of our crew and our shore crew and everyone setting set up there." Local residents have been mesmerized since last fall watching the 90-foot trimarin sail off the San Diego coast.